At Olmoti Clinic, point-of-care ultrasound plays an important role in the quick and accurate diagnosis of many conditions. SonoSim was introduced to the clinic by Dr. Jeff Gold, a long-time SonoSim user at Oregon Health & Science University; with his colleague Dr. Jennifer Bass he provided SonoSim ultrasound education to the local doctors and medical staff. 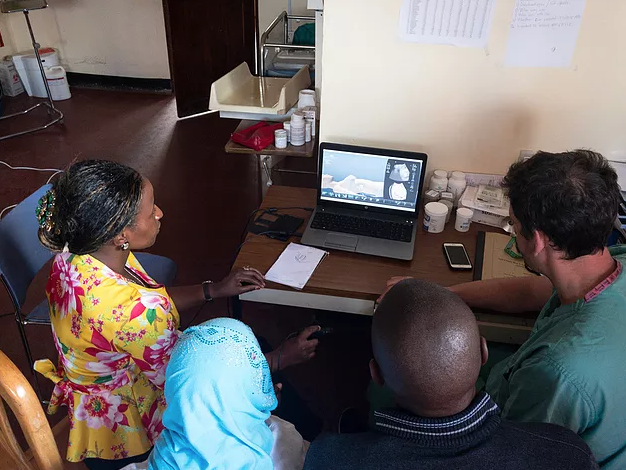 In topics including obstetrics, cardiology, pulmonology and gastroenterology, Dr. Gold, Dr. Bass, and Olmoti Clinic’s lead physician Dr. Richard Nkambi were able to demonstrate and teach techniques for effective point-of-care ultrasound. Dr. Gold, and Dr. Bass’s contributions to the Olmoti Clinic staff have been impactful and sustaining, providing a method to become clinically proficient in ultrasonography, and building lasting improvements in our local health care and education needs.